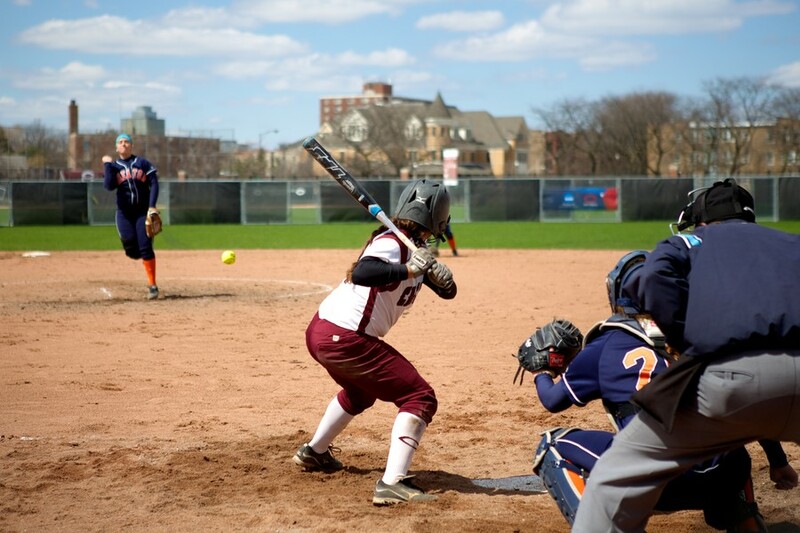 The Maroons broke out of their slump this weekend with a shutout win over Wheaton, but the Thunder retaliated to defeat Chicago in the second game of their doubleheader. After a difficult stint of their season, the South Siders (13–11) ended their five-game losing streak at home on Sunday against Wheaton (15–12), winning the first game of their doubleheader 4–0 before dropping the second, 3–2. Coming into the game, the Maroons were determined to end their recent string of losses and enter the regular season home stretch on a high note. The team was very pleased with its performance in the first contest. The Maroons got out to an early lead, scoring two runs in the second inning. First-year Devan Parkison pinch ran and scored on a sacrifice fly by third-year third baseman Maddie McManus, and fourth-year infielder Vicky Tomaka singled in another run. Once Chicago’s offense was up and running, the win was secured for the Maroons. Fourth-year starting pitcher Kim Cygan threw six scoreless innings, allowing just six hits and two walks, striking out three. The Thunder had an opening in the top of the fourth with runners on second and third and only one out, but Cygan managed to hold Wheaton scoreless, forcing Wheaton into an infield popout and striking out pitcher Lyndsey Pritchard to end the inning. The Maroons increased their lead with an RBI double from first-year Kristin Lopez in the fourth and an RBI single from third-year Zoe Oliver-Grey in the fifth. The game ended 4–0, giving the South Siders their first win since April 7. The Thunder turned things around quickly in the second game, scoring two runs in the first on a two-run homer to left center by second baseman Christina Sanstedt. Chicago threatened immediately but was unable to score after fourth-year Vicky Tomaka struck out with the bases loaded. The Maroons loaded the bases a second time in the bottom of the third and scored on an RBI single by Tomaka, chipping away at the deficit, bringing the score to 2–1. The South Siders tied the score in the bottom of the fourth when Parkison stole home. Wheaton took back the lead with a run in the sixth inning on a bases-loaded RBI single. The Maroons couldn’t break through the Thunder’s defense for the rest of the game, which ended 3–2. First-year Jordan Poole pitched seven innings for the Maroons, giving up six hits, walking two, and striking out one. “We had our opportunities throughout the game and got hits and played solid defensively, but we just needed to have more timely hitting and capitalize on the opportunities when we get people on base,” Bohac said. The Maroons will have a chance to work on those weaknesses this week. Although Monday’s game against Hope was cancelled due to weather, doubleheaders against Aurora, Carthage, North Park, and UW–Oshkosh are still on the schedule. Despite its busy schedule, Chicago is intent on finishing the regular season strong. “We want to focus on one inning at a time and get some W’s in the next few games,” Bohac said. The South Siders will take on Aurora (25–3) on Wednesday in Aurora, IL. They will be a challenging opponent—in addition to their record, they’re undefeated at home. The Maroons will then face No. 25 Carthage (21–7) at home on Thursday. Chicago should expect another tough doubleheader, with the Lady Reds tallying an overall batting average of .332 and an average of 6.25 runs per game. If the South Siders are going to be successful, they will need their defense to be at the top of its game. The Aurora contest is scheduled to begin at 3 p.m. tomorrow in Aurora, IL. Play against Carthage will begin on Thursday at 3 p.m. on Stagg Field.